Dr. Kevin LaChapelle talks to KNLA officials at a KNLA base in Karen State. CHIANG MAI, Thailand — After showing his US passport at the Bangkok airport immigration counter in December, Samuel Thaw, a onetime Karen refugee, felt differently from the way he did 10 years ago. He said he didn’t need to feel afraid of being arrested by Thai police, like the way he felt in the past when he and his family lived with stateless status in a Thai refugee camp. “When they [Thai immigration police] saw my American passport, they didn’t ask any questions. They let me go freely. We don’t need to sneak around anymore. It’s such a big change,” said Samuel Thaw, who used to stayed at Mae La Oon refugee camp, in Mae Hong Son Province, northern Thailand. Years ago, when he possessed no legal documents for living in Thailand, Samuel said he was arrested by the Thai police when he snuck out one time from the Mae La Oon camp. Now, with his US passport, he feels like he is treated with dignity. Samuel and his family moved to the US in 2010 when arrangements were made by the UN High Commissioner for Refugees (UNHCR) and the US and Thai governments. Now he studies nursing at San Diego City College, in San Diego, southern California. But he still recalls the hardships of life in the refugee camp. “It was like living in a prison. I used to sneak out of the camp, and I looked for work to support my family. Life was very tough. We could barely meet our daily needs,” said Samuel Thaw. “Then one day, God opened a window of opportunity. We got the chance to move to the United States. I felt a sense of freedom that I had never experienced before,” he said. Naw Day distributes medicines to patients in Karen State. On Dec. 25, Samuel Thaw returned to Thailand and Burma for the first time since his resettlement in the US in 2010. And he didn’t come back just for tourism purposes; he returned to carry out a humanitarian mission to aid the Karen people—both in Karen State and in the Thai-Burma border region—who have been displaced by civil war. Like Samuel’s family, there are thousands of other ethnic Karen refugees who resettled in the US, Canada, Australia, and elsewhere. The US alone received about 70,000 Burmese refugees who are mostly ethnic Karen people, according to the UNHCR. 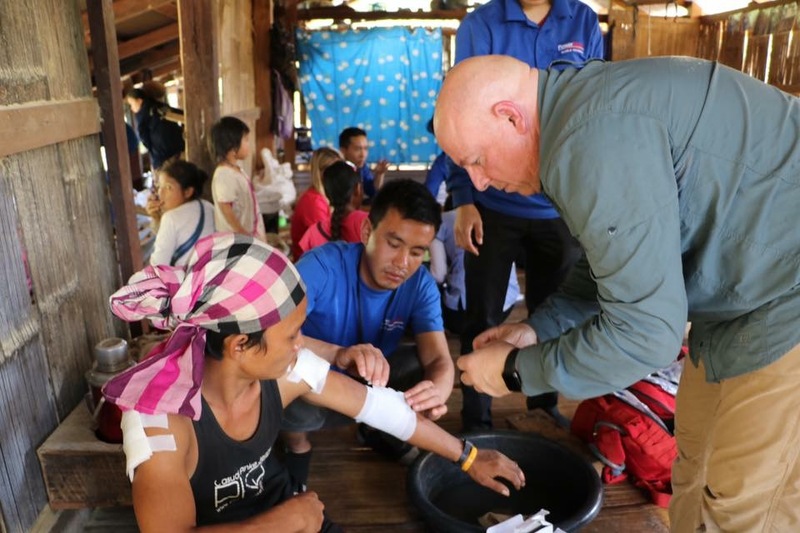 Samuel Thaw’s humanitarian mission to Thailand and Burma was organized by PowerMentor, a San Diego-based non-profit organization founded by Dr. Kevin LaChapelle, a former police officer. PowerMentor’s team visited several refugee camps, including Mae La, Nu Po, and Mae Ra Ma Luang on the Thai border. They team held meetings with leaders of Karen National Union (KNU) and its armed wing, the Karen National Liberation Army (KNLA), and community leaders. They also met the KNU’s vice-chairperson Naw Zipporah Sein, the KNLA commander-in-chief Gen. Saw Johnny, and Col. Ner Dah Mya, commander of the Karen National Defense Organization (KNDO) at their respective bases on the Burma-Thai border. 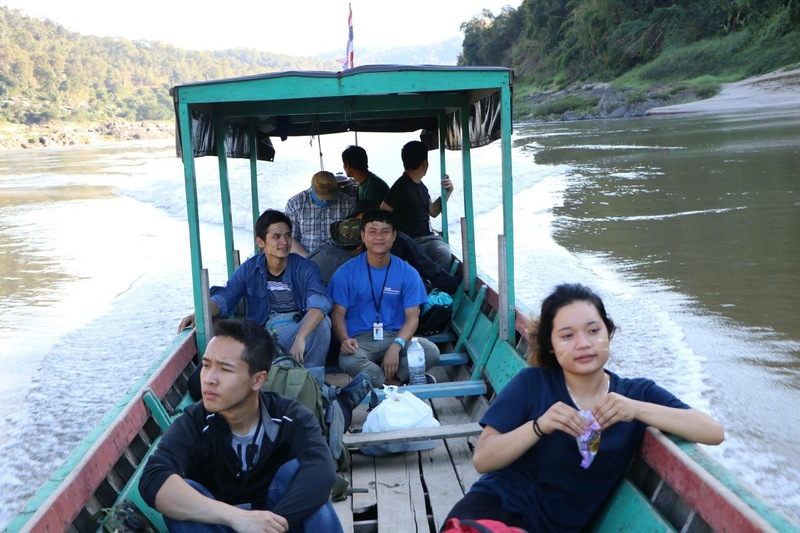 Members of the PowerMentor team travel on the Salween River in Papuan District, Karen State. 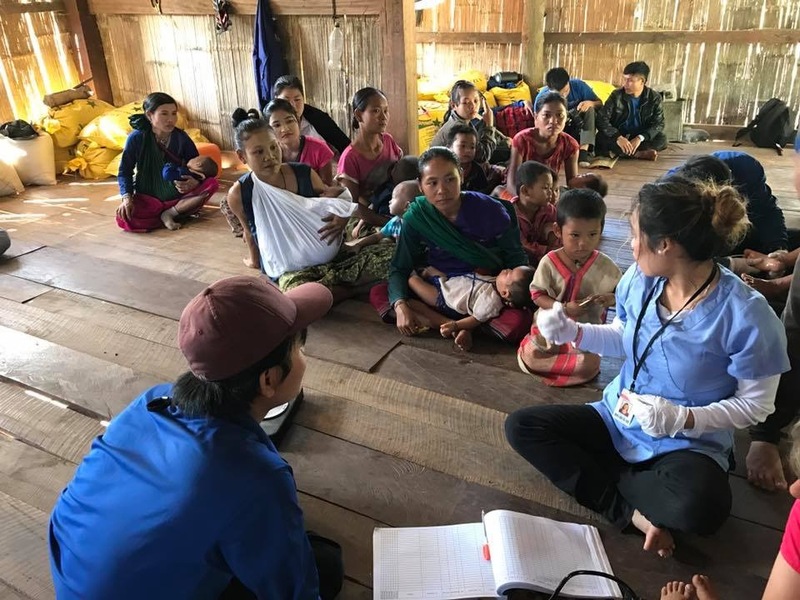 As Samuel Thaw’s humanitarian team met with Karen community members, refugee camp authorities, the KNU, and the KNLA, many Karen people reported that they felt abandoned by the Karen diaspora who have already moved to live in third countries. “Some of them [Karen leaders and Karen people] think that we abandoned them when we left for the United States. But we want to tell them that we haven’t abandoned them. We went to the United States to get a better education and to create a better future. So now we can provide assistance to our people [in Karen State]—things like healthcare, education, and technology. This is our mission,” said Samuel Thaw. Some of the people whom Samuel Thaw interviewed expressed the opinion that Karen refugees moved to third countries because they didn’t want to get involved in the armed struggle. Instead, they were prioritizing their own family needs. Some also disliked the Karen diaspora for expressing criticism of the current KNU leadership and the way it has handled peace negotiations with the Burma Army. Dr. Kevin LaChapelle, PowerMentor’s founder, began his work by mentoring young people in San Diego who were at risk of being lured into criminal activity. He said that he believed the Karen diaspora in San Diego has the capacity and the commitment to give back to their homeland in the future. “I see the capacity of the Karen people, and I truly believe these guys are capable of doing exactly what they say. And what I see in this trip is that the Karen young people want to rise up, but they haven’t been encouraged to do that because of the dynamic of living in refugee camps,” said Dr. Kevin LaChapelle. 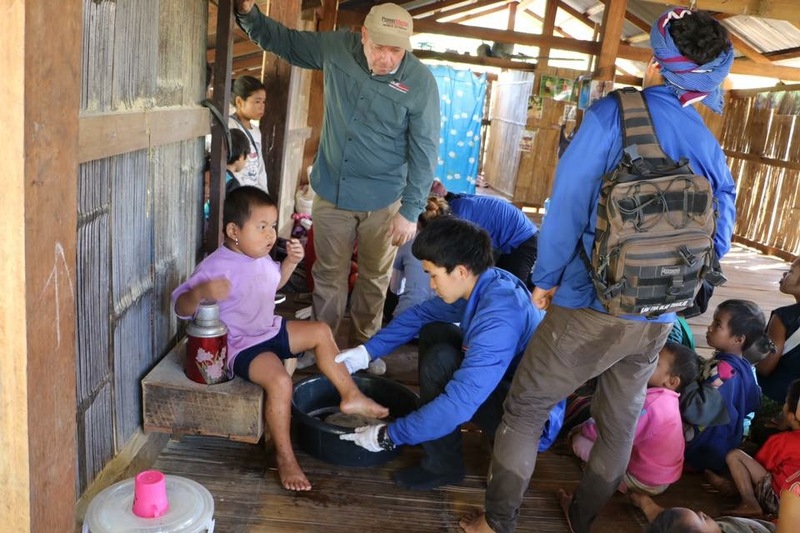 Dr. Kevin LaChapelle provides medical treatment to a Karen patient in Karen State. When Dr. Kevin LaChapelle started working on mobile humanitarian outreach, he first took his program to Mexico and China. Then in 2015, he decided to bring the outreach project to Karen State. He hopes to bring more Karen young people from San Diego and elsewhere to contribute to the humanitarian and education sectors in Karen State. He also met the KNLA’s vice chief-of-staff, Gen Baw Kyaw Heh, during his 2015 trip. “I hope to bring more Karen people next year, not necessarily to come back to fix Karen State. But I want to bring excitement and show them that they are not forgotten. We will campaign and encourage Karen people around the world to send their representatives for our next mission,” said Dr. Kevin LaChapelle. His team brought medical aid and construction supplies, which they delivered to Karen communities they visited. Their projects consisted of medical screening, dental hygiene, education, construction supplies, and clothing distribution. Dr. Kevin LaChapelle’s group also held talks on education, empowerment, and leadership skills with young people who are studying in camps. During their trip from Dec. 25 to Jan. 18, the group also visited a KNU-recognized university known as T Thanbyar Christian Institute in Papun Township, Karen State. “We Karen people are still behind others in technology. We still use cattle or even human resources to do farming. A lot of people don’t know how to use farm machinery. So I want to help in modernizing the technology here,” said Lwe Htoo, a member of the PowerMentor team who studies automotive engineering at San Diego Mesa College. Samuel Thaw provides treatment to a child in Karen State. Another aspect of the PowerMentor mission is to establish healthcare clinics and a hospital in KNU-controlled areas. They will rely on modernized transportation and helicopters to transport the sick and injured quickly. Some of the young Karen refugees in San Diego are taking pilot training courses, and they plan to return to Karen State to fly medical missions, said Dr. Kevin LaChapelle. “After my study, I want to come back and contribute to Karen communities and to the KNU organization. Our leaders want Karen people in third countries to come back and help them in the political administration. I want to help them with administration in line with democratization,” said Hser K. Moo, a Karen college student who traveled with the humanitarian mission. Unlike many young Karen refugees who resettled in the US and encountered problems with alcohol, drugs, gangs, or criminal activity, these young Karen refugees haven’t forgotten their roots. They are committed to contributing to their communities, said Dr. Kevin LaChapelle. About 2,000 refugees from Burma now live in the San Diego area, and a majority are Karen ethnic people, according to the Karen Organization of San Diego. They have been arriving in San Diego since 2007 through the UN Refugee Agency’s resettlement program. Naw Day, another onetime refugee who joined PowerMentor, said that her move to the US was a great opportunity because now she can study and contribute to her Karen people. She said that many young refugees are stuck in the refugee camps with limited freedom and opportunities. Many of them end up in underage marriages, teach in the refugee schools, and work in their local communities without pursuing further education. “Growing up in refugee camp, I didn’t know much about the Karen struggle and what they have been through because I was too young. When I arrived in the US, I got to learn more about the Karen people and their suffering,” said Naw Day. During the recent trip, the PowerMentor team encouraged young people to rise up and get involved in leadership. They also treated sick people and distributed medical supplies and clothes.